Differential beamforming using two microphones, and hence first order, has two different implementations. The first involves a delay of one microphone signal then taking the difference between the resultant and the second signal. 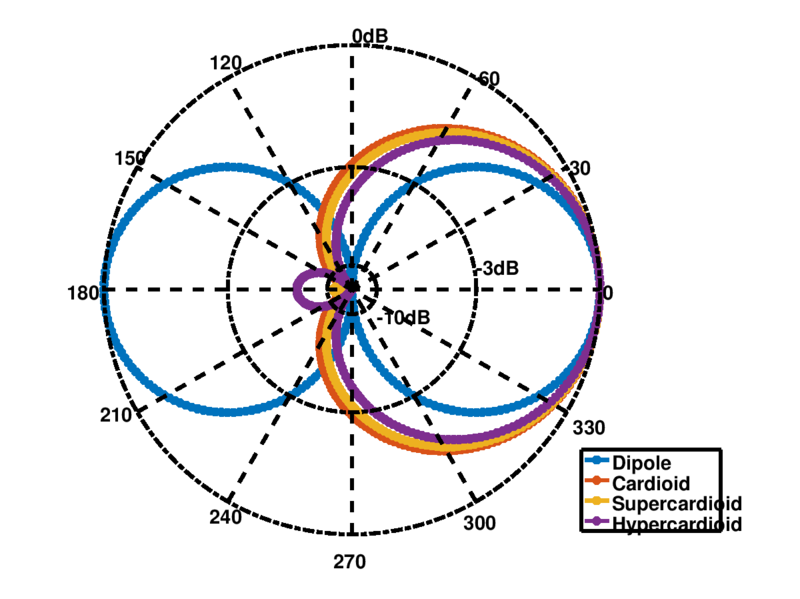 An alternate to this approach is the so-called adaptive differential microphone array beamforming which forms two cardioids and combines them for the required spatial beam pattern. where is the desired beam direction and is a desired null direction. Given and , the choice of will determine whether the spatial beam will be a dipole, cardiod, hypercardiod or supercardiod. The final solution is given as where is a design parameter to shape the beam in the direction of the source signal. The optimal value for can be derived using a second cost function . It can be easily shown that the optimal value of will satisfy Figure 2 below illustrates these 4 spatial beams.